This article is about the neighborhood of İstanbul. For other uses, see Kurtuluş (disambiguation). Kurtuluş, (Turkish for Liberation, Salvation, formerly known as Tatavla meaning "horse stable in Greek: Ταταύλα) is a cosmopolitan neighborhood of Şişli whose population consists of Turks, Greeks (now almost completely emigrated), Armenians (who still live there in numbers), Kurds (who are relatively recent economic migrants), and Jews (who still live there in numbers). The Turkish name means "independence" or "deliverance". The neighborhood's name was changed to Kurtuluş, six years after the Republic of Turkey was founded, for its rebuilding and symbolizing its rejuvenation, after a fire swept and largely destroyed the neighborhood on 13 April 1929, with 207 houses going up in flames. Despite the turmoil of the Balkan War, followed by World War I and the following Greco-Turkish War (1919–1922) and the devastating fire, the neighborhood continued to retain its large Greek population and atmosphere, at least until the riots of 1955. 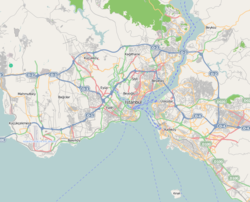 It was typically the residential area for Greeks of more modest income, as opposed to, for example, Tarabya on the Bosphorus, where richer Greeks as well as rich Turks and Europeans lived. Nevertheless, a number of beautiful houses were built in the late 19th century, some of which still stand today. ^ a b Didem Danis, Ebru Kayaalp. "Elmadag: A Neighborhood in Flux" (PDF). Institut Français D'Etudes Anatoliennes GEORGES DUMEZIL. p. 19. Archived from the original (PDF) on 1 March 2012. Retrieved 16 December 2011. ^ Mullins, Ansel. "Reviving Carnival in Istanbul". New York Times. Retrieved 1 November 2011. Şişli Belediyesi (Şişli Municipality). Tarihçe (Brief history). https://web.archive.org/web/20100302202602/http://www.sislibelediyesi.com/yeni/sisli/t1.asp?PageName=tarihce Retrieved 15 September 2009. This page was last edited on 4 March 2018, at 01:19 (UTC).